Sakai Guides and DocumentationSakai Complete User Guide Site InfoHow do I import content from an archive file? Click Import from Archive File. Choose a file to import. Click the Choose File button to browse for and select your import file. Once you have located your file, the filename will display on this screen. Note: Sakai supports several import file types (e.g. IMS Common Cartridge Archives, Blackboard Archive files, etc.). However, you may need to check with your system administrator to determine the file import options currently enabled on your system and the best file format for you to use. Click the Import button and wait for the file to be uploaded and processed. Depending on the size of the file, this may take some time. Select the content to be imported. Zoom: Select the content to be imported. You will see a list of content types from your import file on the left. Click on the item you want to import to select it. (You may select multiple items using CTRL+Click for PC or CMD+Click for Mac). Use the right arrow button under Move to move the item(s) over to the list of material to be imported. 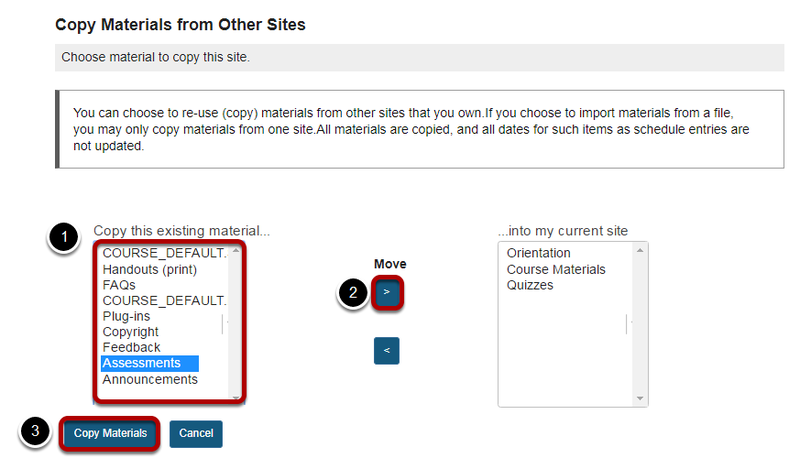 Click Copy Materials to import the selected content. Confirm the copying of the listed tools into the present site and click the Finish button. Prev: How do I copy my content from one site to another? Next: What is the User Audit Log?